I really enjoyed this book. It’s about a young man named Peter whose grandfather just passed away. He has many fond memories of helping his grandfather on the farm in Minnesota and wonders why his father didn’t stay there to take over the farm. He resents his father, who is a musician, for always moving around while he was growing up and for missing his grandfather’s funeral. Peter is between jobs and he and his new wife Mae are staying in her parent’s basement which hasn’t been ideal. Mae’s mom doesn’t think Peter is good enough for her and Mae ends up leaving with their mother-daughter relationship in ruins. Peter’s Grandmother mentioned one day that her husband Roy had always hoped someone in the family would take over the farm and Peter thinks that is what he wants to do. He talks to his wife and his grandmother and they decide on a trial period to see how it goes. Mae finds out very quickly that outsiders have a hard time fitting in with small town folks where everyone knows everyone’s business. Peter loves farming but has a hard time keeping up and is worried about paying back his operating loan. The story continues to tell of some of their trials on the farm. I really like how the author inserted sections in italics that tell a small story from the past. That allows the reader to get to know the people in the small town and how they relate to one another. You learn a little bit of history right when you need to. The stories are very well written and make you feel for the people in the story. After reading this book you are left wondering what’s next and there are two more books “Dandelions in a jelly jar” and “aprons on a clothesline”. This isn’t just a book about farming. It’s about being new and trying to fit in where newcomers aren’t welcome. It’s about love…. and family. It’s about coming through difficult times unscathed and knowing you are not alone in the world. So that was a great book. I finished it last night and I’m ready to get started on the next one. I don’t want to give anything away but that book ended with me in tears! I am pretty good at not crying during sad parts in books but that one got me! UGH! No one could get away with not crying at that….. or……like say, the Notebook (book or movie). One thing I really liked about this book or more about the author’s style of writing is it is like a collection of small vignettes – small stories that connect. So you can easily put it down to get something finished and come back to it. I usually have a hard time putting a book down and just want to KNOW WHAT HAPPENED!!!!!!! This book is more relaxing and though the story hangs in the back of your mind it isn’t so urgent that you get all the details right away. I actually don’t want to finish too soon because there are only 3 books and then I always end up missing the characters and wanting the story to continue. This book is one of those descriptively written books that leaves you with a movie in your head. It’s like watching a good show on TV… like little house on the prairie where there are different people who interact and you get attached to each one. 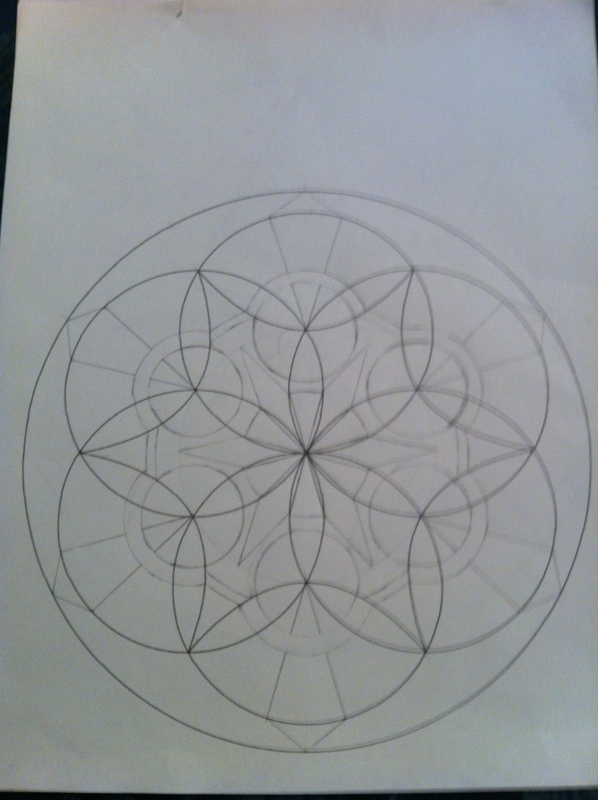 In other news, I am working on my mandalas. I haven’t taken any pictures yet but I’m getting anxious because my prince is coming back home tonight! I’m waiting on pins and needles for his call that he’s arrived. Since it is so cold I’m going to just pick him up at the door with a warm car and not bother going inside. My hands are already hurting from being outside and getting too cold yesterday. It doesn’t feel like the arthritis this time. It feels more like the fibromyalgia in my hands… just hurting in random places and not at the joints. I have been getting sharp pains all over and just want to lay down and stay bundled up. I wish I didn’t have to go out but at least I don’t have to get out of my car. I wonder………. if I kiss my prince when he gets here will he turn into a frog? I hope not. 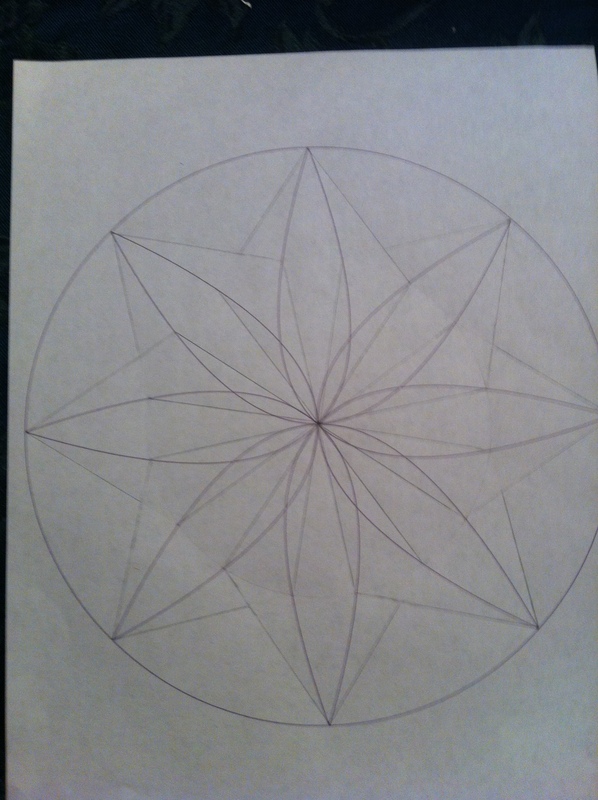 Edit: I decided to add some pictures of my mandalas. These are just the practice ones on the templates so they are just pencil on printer paper. It may be difficult to see the pencil lines but we’ll see. 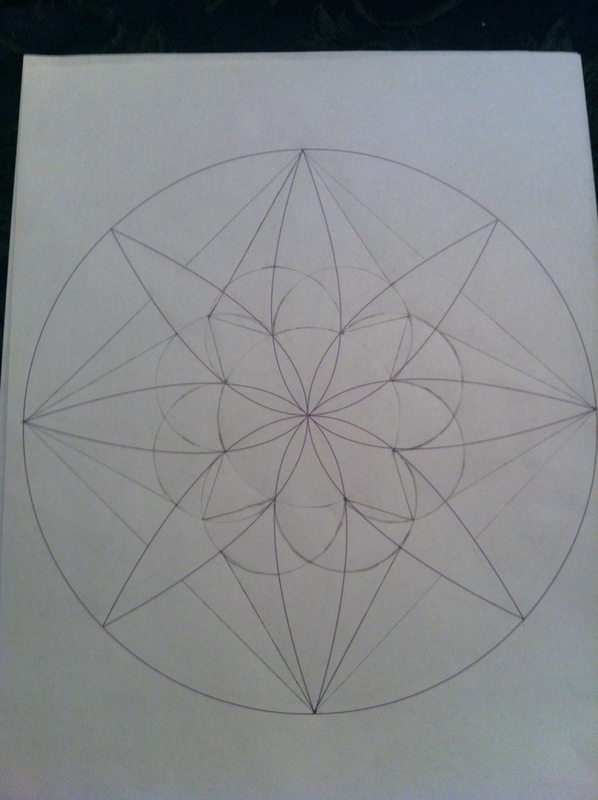 I should have some color mandalas to show soon. 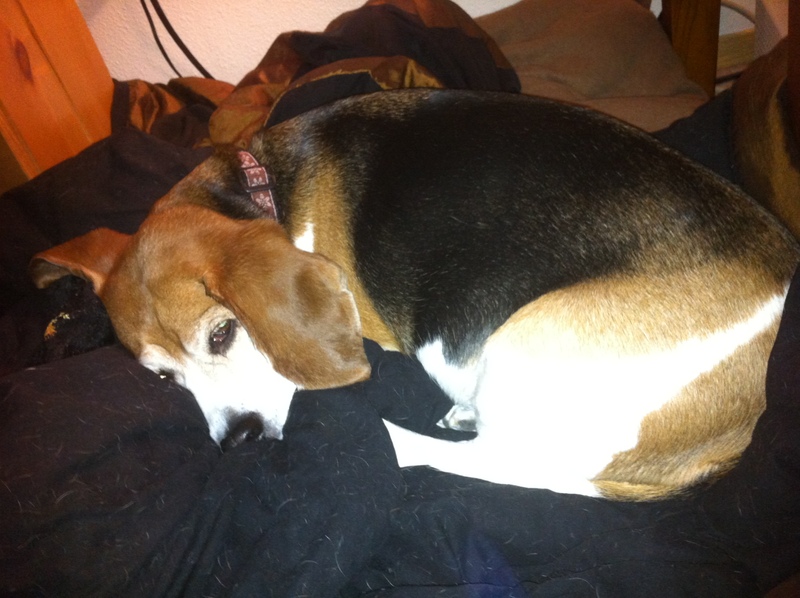 Oh and a picture of blue looking so cute snuggled up on her queen sized blanket. She is not going to be happy because her blanket is going into the wash in a minute. Eventually I’m going to cut this down to fit better on her bed. Oh Rita, funny you say that because I just edited my post to add some pictures of my altered mandala templates. I sounds like a great book series. I may have to think about getting them to read myself. 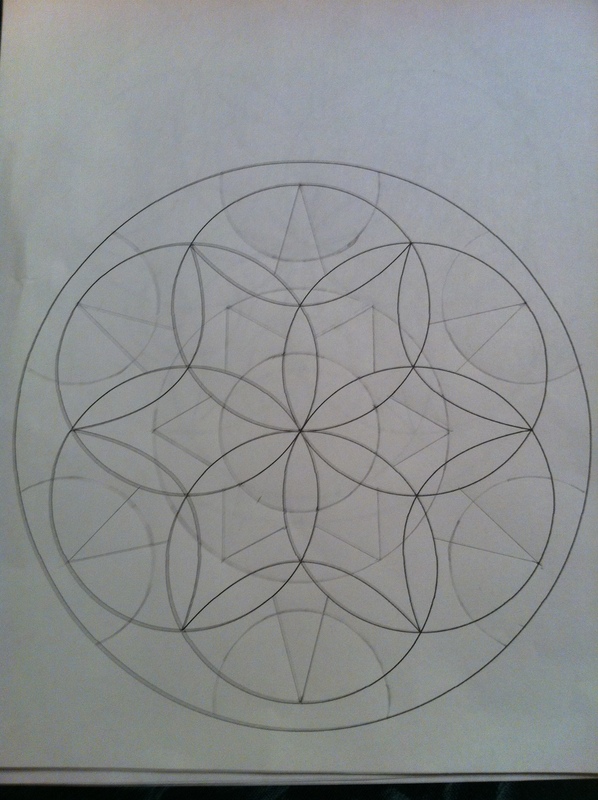 Your mandalas look GREAT!! I’m looking forward to seeing them in colour. I’m happy for you that you get to have your hubby home again. Sorry your hands are hurting tho. I suffer with bad arthritis pain too, mostly in my hands and feet. Some days are worse than others but I do have daily pain to some degree. Is it like that for you? Blue reminds me so much of my Cody who loves to lie in his dog bed while I work away at the computer. He also lies on the couch in the lounge room and on my bed throughout the night. Basically, wherever I am, Cody is there too. He’s one spoiled doggy.